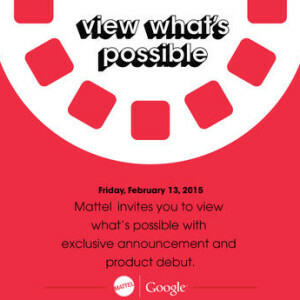 Next Friday Google and Mattel are announcing a new product…but no word on exactly what it’s going to be. Based on the “view what’s possible” and the image, I think the safe bet is on something View Master. They sent out invites this week and the product debut will happen in New York City. The 94-year-old company declared bankruptcy and announced they’ll be closing the lion’s share of their stores. Sprint is going to be purchasing some of them—1,750, to be exact—and will be opening co-branded shops in those locations. The balance of the other company-owned stores, from the sounds of it, will close….maybe. A Bloomberg report says Amazon may be interested in purchasing some of those soon-to-be-closed stores. They’d use the locations to feature Amazon hardware and possibly as package pick-up/drop-off centers. I love it when something completely low tech hits the tech blogs—in this case, the publishing of Harper Lee’s second book. It essentially a sequel to To Kill a Mockingbird, but she actually wrote it first. Go Set a Watchman is set 20 years after the first book and follows “Scout” in the mid-1950s during the Civil Rights Movement. You can preorder the book now on Amazon, or watch for it at your local shop in July. Bursting on the scene unexpectedly early, this week the Raspberry Pi 2 hit the market. Fans thought they wouldn’t see an upgrade to the original until 2017, but much to their delight it arrived this week. The new Pi has a 900MHz quad-core chip, 1GB of RAM which should give it “at least six time the performance of the old Model B+.” What’s maybe equally great is that jumping to the Pi 2 won’t set you back more—it’s selling for $35, the same price as the previous model—and Microsoft announced it’ll be offering a version of Windows 10 for Pi. Sure, others have tried this “location of things” idea, but I’ve gotta say Pixie looks like the best one so far. Perhaps it’s just because I have a 10 year old who would lose his head if it wasn’t attached, but I seriously want some of these. They’re guitar pick shaped, waterproof, tags you can place on things you might lose…but they’re pretty uber. The Pixie app has an “augmented reality” view that shows your item with a big X marking the spot (like a treasure hunt!). It also uses triangulation to increase accuracy as you add more points to the location network. AND, you can create “zones” so if you move too far away from an item you’ll get an alert, AND you can create virtual “kits” for multiple items (like your wallet, keys, and phone). Shut up and take my money. If you’re a Gen X’er, you’re already familiar with Swatch, the purveyor of colorful and fun watches. Well, the Swiss company plans to introduce a smartwatch just in time to compete with Apple’s introduction. Swatch’s CEO said the watch will connect to the Internet and all of that—but it won’t need to be charged (like, ever). That’s what Swatch is saying, anyway (and as Bloomberg points out, they do have a lot of battery innovation history, including making batteries so thin they are bendable). Time will tell (see what I did there??) if it’s true and whether battery power could limit the watch’s functionality (Bluetooth and such burn up lots of power!). The New York Times has a really interesting piece about the rise and fall of Google Glass. The author, Nick Bilton, traces the product from its beginning as a quiet and secret project, to its recent downfall (you knew when the Google Glass owners were nicknamed “Glassholes,” it wasn’t a good sign). The piece suggests Google Glass is going to get a complete redesign—and won’t be released early via any kind of “Explorer” program next time around. If you’ve got a few minutes and have been curious about this media darling product, I’d recommend it.